**** HUGE UPDATE: Holy empress runs a very close 3rd to Duchess of Lennox at scone on April 8. 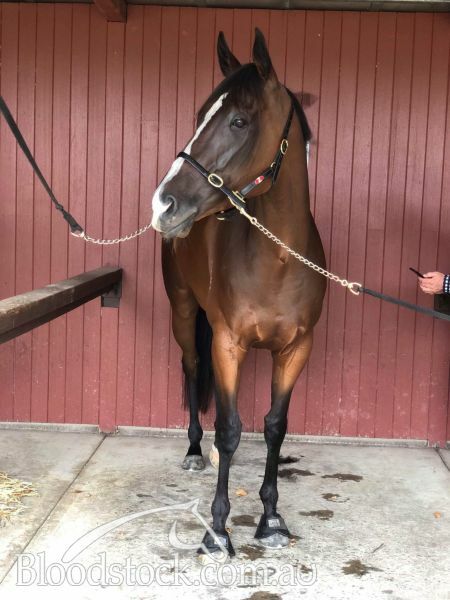 Duchess of Lennox is being aimed at the Group 1 Queensland Oaks and is now at 10-1 odds to win the Oaks so this form is well and truly franked. This was holy empress first run at 1600m and she is now primed to run over 1600m and above going forward. Holy Empress is a 3yo filly who has had only 5 starts for 1 win and 2 placings with over $22,000 in prizemoney. She has a wonderful pedigree being out of a redoutes choice mare and in the same family as the superstar "Saintly” and the stallion Gods Own. At her debut, she ran a close second over 1300m which was followed by her debut victory where she travelled wide the whole way to overpower her rivals. Being by Roman Emperor, her trainer Scott Singleton is confident she will be best suited at a mile and beyond. At her first start from a spell at Nowra on 25 February 2019, she was caught 4 and 5 wide and ran a huge race to be beaten only 1.8 lengths in 4th behind Gai Waterhouses sebring filly Wimlah. If you want to race a horse right now who has massive upside and a super pedigree, instead of waiting 12 months plus for a yearling to race then this is your opportunity. ROMAN EMPEROR (NZ) (Bay 2005-Stud 2011). 2 wins at 1550m, 2400m, A$1,416,800, Australian Derby, Gr.1. Half-brother to SW Rios. Sire of 41 rnrs, 24 wnrs, inc. SW Emperor's Way (ATC Randwick City S., L) and of Roman Typhoon, Gold Denari, Nepean, Roman Son, Imperator Augustus, Latin Boy, Ave, Valeria Messalina, Caesar's Ghost, Etheridge, Holy Empress, Britannicus, Lady Loft, Drusilla, Savona Sunset, Colosseum King, Mandalong Emperor, Roman, etc. Holy Empress (f by Roman Emperor (NZ)) 2 wins. See below. Didache (g by Bernardini (USA)) Winner at 1100m in Aust. PURE GRACE, by Woodman (USA). Unplaced. Half-sister to SAINTLY, GLIDE AWAY, Aucash, Blessed Be (dam of BLESSUS). Dam of 4 foals, 3 to race. SAINTLY (g Sky Chase) Aust. Horse of the Year & Champion 4YO+. 10 wins-1 at 2-from 1200m to 3200m, A$3,796,150, VRC Australian Cup, Gr.1, MVRC WS Cox P., Gr.1, VRC Melbourne Cup, Gr.1, VATC CF Orr S., Gr.1, AJC Expressway S., Gr.2, STC Hill S., Gr.2, VRC Carbine Club S., L, AJC WN Parry-Okeden 2YO H., City Tatt's RC Tatt's Club H., 2d Australian Derby, Gr.1, STC Rosehill Guineas, Gr.1, AJC Warwick S., Gr.2, Apollo S., Gr.2, VATC Sandown Guineas, Gr.2, NSW Tatt's RC Chelmsford S., Gr.2, AJC Craven P., Gr.3, Victory Lad H., 3d STC Mercedes Classic, Gr.1, AJC Metropolitan H., Gr.1, STC Aspirant 2YO H.
GLIDE AWAY (g Dahar) 6 wins from 1300m to 2000m in Aust. and Malaysia, Selangor TC Tunku Gold Cup, L, Penang TC JE Johnson S., STC Peter's Empire H., Beverley Park H., 2d AJC Frank Packer P., Gr.3, Selangor TC Tunku Gold Cup, L, Class 1 H., AJC Wentworthville Leagues H., STC Bexley H., 4th AJC Dulcify H., L.
Aucash (c Danehill) 7 wins-1 at 2-from 1000m to 1600m, HK$6,219,670, HKJC Fukuoka H., Po Yan H., Hin Keng H., Chongqing H., Choi Hung H., Jordan H., Glenealy P., 2d HKJC Dubai H., Tsung Pak Long P., 3d HKJC Chairman's Trophy, L, 4th Hong Kong Classic Mile, L. Sire. BLESSUS (g Fusaichi Pegasus) 6 wins to 1400m, A$279,760, Hawkesbury RC Yalumba Cup, L, STC Birds Eye View H., AJC Cadbury Dairy Milk H., STC Sydney Markets Ltd H., Winning Edge Presentations H., 2d AJC National Jockeys Celebration Day H., Randwick Betting Auditorium H., 3d STC Rosehill Gardens Grand Pavilion H., Roxy Hotel Parramatta H., 4th STC Royal Parma S., L.
God's Hand (g Galileo) 7 wins from 1050m to 1800m, A$337,380, MRC Selangor Turf Club H., AJC Randwick Betting Auditorium H., STC Vabys Restaurant H., Parramatta Leagues Club H., BRC Peroni Nastro Azzurro H., 2d Seymour Cup, L, AJC Marriott Hotels Welter H., STC Milton Meats H., AJC Tooheys New H., 3d STC Kingston Town S., Gr.3, AJC Hall Mark S., L, MRC Lord S., L, VRC Tauto H., AJC Autumn Racing Carnival H., Coremed Spiggle & Theis H., STC CFMEU Mining & Energy H., Young Members Day 2YO H., BRC Woolworths P., 4th STC Ajax S., Gr.2, MRC Victoria Gold Cup, L.
Indirect. 2 wins at 1200m, A$164,396, VRC Long Tan H., AJC Analie H., 2d STC Big 6 Cox Plate Jackpot H., Jim Beam H., MRC Desirable H., 3d MRC BMW Melbourne Classic H., 4th AJC Nivison H., L. Producer. Opera Bouffe. Winner at 1300m, STC Rydalmere H., 2d AJC Crossing H., 3d AJC Jack Bourke H., STC Yuletide H.
Sir Victor. Winner at 1600m in Aust. Night Follies. Winner at 1400m in Aust. Producer. GOD'S OWN (c Redoute's Choice) Joint Head of The 2005-06 Australasian 3YO Classification. 3 wins-1 at 2-at 1200m, 1600m, A$999,500, MRC Caulfield Guineas, Gr.1, AJC Ladies Auxilary 2YO H., STC Mounties H., 2d VRC Lightning S., Gr.1, MRC Guineas Prelude, Gr.3, Schweppervescence Cup, Gr.3, 4th STC Golden Rose S., L. Sire. MESSENGER (f Choisir) 3 wins from 1550m to 1900m, A$198,560, STC Epona S., L, Gosford RC Belle of the Turf S., L, STC Freeway Hotel Artarmon H., 2d AJC Heat of the Moment H., STC Kettle H., 3com Virtual Network Solutions H., 3d AJC Wiggle H., L. Producer. Race Record: 2 wins at 1300m, 1850m in 2018-19 in Aust. 30/Jan/2018 3rd of 3 --trial--Hawkesbury RC Barrier Trial, 760m. Partners was 1st and Spatula 2nd. 23/Jul/2018 1st of 6 --trial--Hawkesbury RC Barrier Trial, 1000m. Sparkling Rose was 2nd and She's Furline 3rd. 07/Aug/2018 3rd of 7 --trial--ATC Barrier Trial, 1030m. Molly Malone was 1st and Yulong Jupiter 2nd. 11/Jan/2019 8th of 10 --trial--ATC Barrier Trial, 1050m. Lucand Lad was 1st and Decroux 2nd and Fast Evolving Girl 3rd. 22/Jan/2019 9th of 10 --trial--ATC Barrier Trial, 794m. Oh My Mimi was 1st and Seewhatshebrings 2nd and The Soloist 3rd. 08/Feb/2019 3rd of 4 --trial--Hawkesbury RC Barrier Trial, 1250m. Helga was 1st and Base Camp 2nd.